The Linn 9000 shipped way back in 1984, but could nearly pass for a shipping product today. 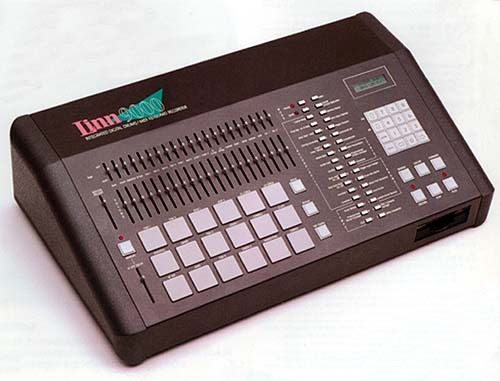 So, since the LinnDrum II mock-ups look nothing like the current design, let’s feast our eyes on this instead. Roger Linn, father of the modern drum machine and creator of some of its greatest models (including the MPC60 and MPC3000), really is working on a new generation. I’ve seen some of that design work, and I’m confident it’ll ship in some form. But announced yesterday, that shipment won’t happen third quarter this year. Also, it seems that, while this was always a LinnDrum and not a SmithDrum, the product is tending even further toward the Roger Linn side and not so much the Dave Smith side – especially with Dave Smith’s own synth business going great guns. I will say, I prefer a few months’ delay with fewer compromises (or in this case, maybe a lower price). The big names in the industry have such firm release dates that often some significant functionality slips instead of the ship target. Part of the reason a lot of people don’t talk about projects before they’re done really isn’t competitive secrecy – it’s because the evolution of a hardware design can be unpredictable. We’re still hard at work but regrettably won’t be able to meet our earlier estimate of a 3rd-quarter 2009 ship date. The recent changes in the economy have caused us to rethink our design, which had become too expensive. One problem is that Dave’s customers and my customers had different views of what the product should be, so we had been working on a more elaborate design that we thought would please them both. Then the economy tanked. Oops. The other issue is that Dave and his team have been having such success with their analog synths that they’ve been spreading themselves pretty thin trying to work on both projects. So given these circumstances, we’d prefer not to state another release date estimate at this time, but when we do we promise to post it here along with any other information we’re able to release. Also, given that Dave and his team have their hands pretty full and that a beat-oriented product is more of a Roger product anyway, we’ll probably be selling it through Roger Linn Design instead of from both companies as we had previously considered. I’d personally love to tell everybody all the details of the product design, features and price as we did with our initial designs of the product, but there’s that pesky problem of keeping the information from our competitors. So we need to keep tight-lipped for now and regrettably can’t answer any questions. Thanks also to those who have kindly asked to place advance orders. However, we don’t feel it’s right to accept orders until we are able to release the price or more information about the product.